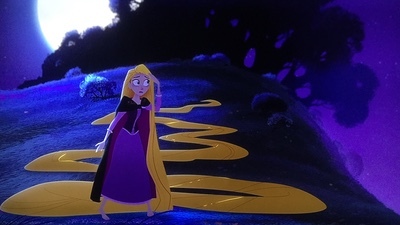 Hair-tangle magnet Rapunzel returns – and so do her long, magical golden locks – in a television movie geared to kickstart a series based on Disney’s 2010 animated feature. There was a time back in the 1980s when Disney television animation almost matched the quality of the Feature Animaiom department, admittedly not such a huge leap when compared to the likes of The Fox And The Hound and The Black Cauldron. Previously to the Studio’s jump into afternoon programming, animation for the small screen had been handled by the feature artists themselves, on such programs as Disneyland and The Mickey Mouse Club, with Ward Kimball especially being responsible for many fully-animated shows and specials from the 1950s onwards into the 1970s. A decade later, when Walt Disney Television Animation was founded under the new management team of Michael Eisner, Frank Wells and Jeffrey Katzenberg as its own division, there was real concern that the proposed programs look better than anything seen on a Saturday morning from the likes of DIC Entertainment, for example. “We can’t go out looking like trash” was essentially Eisner’s edict, and so those early Disney shows – the Wuzzles, Adventures Of The Gummi Bears and DuckTales – had real production value, so much so that both those initial two series’ pilot shows got European theatrical releases as featurettes with reissues of classic Disney features, and the first five episodes of DuckTales were also packaged as a TV movie. The higher quality was good for TV animation overall: soon other producers were upping their game, such as Warners’ move into Tiny Toons and Animaniacs territory, and Disney’s own expansion of the TV unit into what would become the DisneyToon Studio, producers of the better-end of the television product and the seomtimes dreaded direct-to-video output of the 1990s and early 2000s. As other studios began to catch up, Disney’s shows didn’t always look so great, particularly when coupled with lower budgets, especially on feature film spin-offs such as series based on The Little Mermaid and Aladdin, which brought in a “black marker” era of small screen animation where outlines were routinely thick and the artistry fairly non-existent, leading me to forgo many of the Disney television shows of the later 1990s and onwards. The visually varied looks of other studios’ shows, such as those seen on channels like Cartoon Network and Nickelodeon (and then NickToons) saw Disney drop their finely crafted art even further, going for the simple or exaggerated designs of Doug, Teacher’s Pet, and any number of wildly uneven programs in between, the most successful perhaps being those based on the classic characters (Goof Troop or MouseWorks, which occasionally featured a segment actually animated by the Feature Animation crowd) and the long-running Kim Possible, probably the last Disney TV series I had any real interest in. Yes, there has been an explosion of cartoons for small screens in recent years, although the rise of cheap CGI hasn’t meant a rise in quality – some of those shows can look pretty hideous, while some of the ostensibly hand-drawn stuff has gotten more fluid thanks to compositing technology. Some will argue that a show need not look great because the storytelling is the main thing, but being that animation is primarily a visual medium, I do often find it a hindrance when the artistry isn’t on par with a project’s aspirations; Star Wars: The Clone Wars worked great when it was a hand-drawn, highly stylised micro series, but I’ve never been able to plug into the CG version, nor that of the follow-on Rebels series, simply because the visuals don’t come anywhere near matching up to the storytelling aspirations or the visual blast of other Star Wars properties. 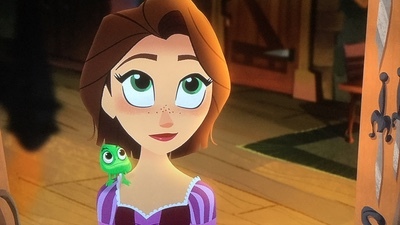 But, for the first time in quite a while, I was intrigued when Disney announced the television continuation of the Tangled franchise, itself already spun off into a short film, Tangled Ever After, especially when it was revealed that the series would sport a traditional animation aesthetic, making for interesting hand-drawn comparisons to the orginal film’s georgous CG renderings. For me, Tangled still stands tall as perhaps the best of Disney’s recent return to fairytale musicals, combining a rich understanding of the Studio’s legacy while forging its own modern identity, paving the way for Frozen and the current trend of revisiting Disney’s animated classics in live-action retellngs. 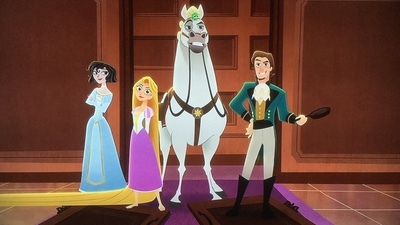 It was even more of an enticement to hear that the film’s major principals, voice artists Mandy Moore and Zachary Levi, and song composers Alan Menken and Glenn Slater would be penning some new tunes for the series’ debut movie which, as the title suggests, slots in after the original feature but before the Ever After short. Thankfully, and to its credit, Tangled for television doesn’t attempt to copy the exquisite CG of the feature, and although it’s something of an odd thing to write that the visuals have a caricatured look when we’re talking about animation to begin with, the cartoony approach matches the more, literally comic tone, right from a whizz-bang recap of the orginal film’s plot for those that missed it. Told in stills, the visuals here remind of Mary Blair’s concept art for many a Disney picture, especially Cinderella, and it’s this approach that pretty much gets translated into the new animated style, which has a traditional look but, I’m guessing, is actually a CG hybrid of the Paperman and Feast technology, as seen in those two recent Disney short films, but refined to lose some of the Xerox-y look. I know it’s not actually Flash Animation per se, but it still has that manipulated feel about it and, in full color, I was also reminded of the classic Little Golden Books, again which Blair was once a major contributor, as well as current CG Disney Princess shows Sofia and Elena in motion, though there’s a hint again of that initial Clone Wars series in the designs, too. In short, it’s a pleasing combination of what passes for decent CG animation on television these days with a more traditionally animated aesthetic, making for an overall attractive presentation that perhaps lies on the more over-saturated colorful side but gets away with it due to its storybook feel (even if the animation occasionally has trouble with that age-old toughie…galloping horses!). With the visuals up to scratch, the perhaps bigger question is how do you follow up a fairytale story that has a definitive end? This hasn’t really bothered Disney in the past, where the likes of Ariel and Aladdin’s further adventures seemed to just occur without much regard to where they slotted into their respective timelines, but here there’s a clear attempt to create additional stories that pick up from where the original movie left off – in so this case having the issue of how you present the previously golden haired Rapunzel as we traditionally know the character, but who had to cut off that hair (and went brunette) as a story point in the movie! The answer is perfectly convoluted and nonsensical in a Frozen kind of way, begging the question of why she can’t simply cut it off again and how she must eventually lose it to tie in with the Ever After short. 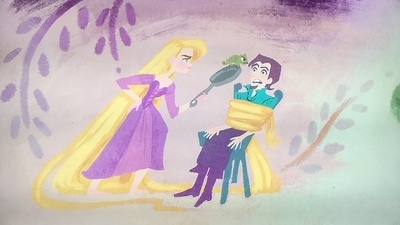 It does feel like this happens just so the tie-in merchandise can feature the Rapunzel from the movie, and probably gives the writers some added room to work in future hair gags, but somewhat feels less organic than it should. 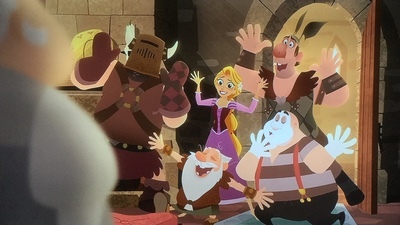 In other areas, the film is often a little slavish to the precedent set by the first film, but this is no real bad thing in itself, meaning that the humor so prevalent in Tangled is in full effect again here, though there’s also a tinge of Frozen‘s early moments, especially in the opening song Life After Happily Ever After which, it has to be said, isn’t exactly Menken and Slater’s finest moment but could potentially be a grower. More of an immediate hit is Rapunzel’s later ballad, Wind In My Hair, and its reprise, which feels more authentically Tangled even if it does kind of repeat sentiments the character has already professed in her initial outing and somewhat stops the action dead in its tracks here. Story-wise, things are fairly simple, and older viewers may sometimes be reminded of similar kinds of scenes and setups in everything and anything from the highs of Frozen (which it seems the series may feel like it’s more a sequel to, tonally) to the lows of DTV dreck Cinderella II (in Rapunzel’s getting used to the royal life) and Pocahontas II (as Rapunzel again has to contend with adjusting to different social etiquettes), and an out of nowhere revenge plot feels rote and more than a little bit of a stretch. Yes, it can of course easily be argued Tangled: Before Ever After is intended for kids, but as a herald for a major new Disney series promoted as a television event, and featuring the return of such high-profile talent from the theatrical film, I think it’s also fair to say it’s open to some scrutiny. 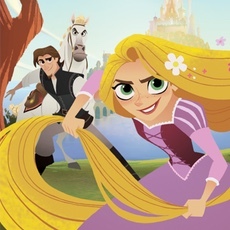 Happily, this new iteration doesn’t stray too far from what made the original movie so enjoyable and, even if it does occasionally lapse into some of the pitfalls and trappings of television writing, it bodes well for Tangled: The Series‘ mission to provide new adventures for Rapunzel and Flynn on their way to their eventual wedding. As a Disney Channel movie coming quickly, and only, to standard definition DVD, you probably shouldn’t be expecting much in the way of extras…and you’d be right! While it may have been nice to have even just a brief soundbite-heavy clip on how the artists translated the CG characters to a tradigital look, how the voice cast felt about returning to their roles, or the enthusiasm of Alan Menken to become involved in a television follow-up, that is sadly not to be. A bright and colorful sleeve (on which Rapunzel seems to look a little too fierce, I think) is replicated on an unexpected slipcover that bumps up any collectible aspirations for the title, while the younger target audience may well appreciate the bundled-in replica of Rapunzel Journal, which I didn’t assemble but that looks to be pretty durable for what it is; a nice touch in giving a little extra value to the title and making it just that little but more special. 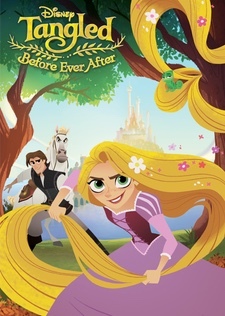 With a totally new animation production approach that’s highly stylised enough to potentially divide fans of the original, there’s still no denying that it looks splendid on this disc, the sharpness, color accuracy and overall short hour-long length of the digitally mastered content all going to make Tangled: Before Ever After look great even in standard definition, with a high bitrate and zero compression issues. With the returning song composer (Menken doesn’t provide the score music) and feature vocalists, Tangled: Before Ever After‘s sample-orchestra soundtrack is nothing short of big-screen worthy and certainly plays a part in making what could have come off as a poorer cousin feel substantial. English, French and Spanish dubs and subs come as options. 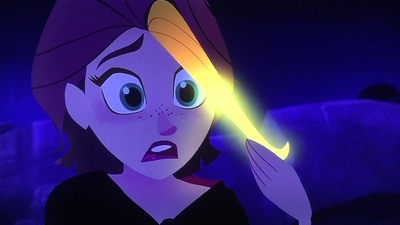 The animation style is all that pulls this Tangled continuation out from slotting in perfectly between the original feature and its follow-up short, with a fine new song for Rapunzel herself from Alan Menken and Glenn Slater, and largely solid production values. The swap to a hand-drawn, albeit digitally rendered, look suggests what the characters may have looked like had the Rapunzel story been attempted in the tradigital 1990s, and it mostly pulls off the approach, save for a few elements that just don’t quite make the transition. But the artwork can be appealing at times and the vocalists are clearly enjoying playing their old roles again, even if the story is lightweight and only justs hold the attention of fans of the original, while a couple of new characters don’t quite make their mark and might need better explanation in the continuing series. 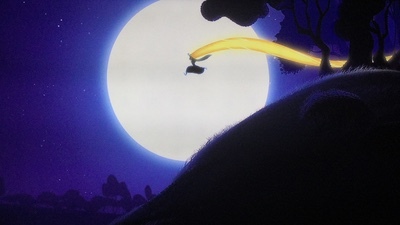 I’m not quite sure how the writers will continue to explain Rapunzel’s golden flowing locks and how she’ll lose them again in time for the Tangled Ever After short that the series will eventually link into, but it seems it will be a fun adventure getting there, and Before Ever After (albeit in a convoluted fashion that feels intentionally but unresolvedly open ended) tees things up nicely for what is to come.